PHILADELPHIA (WPVI) -- A fourth nor'easter brought a lot of snow to the Delaware and Lehigh valleys. 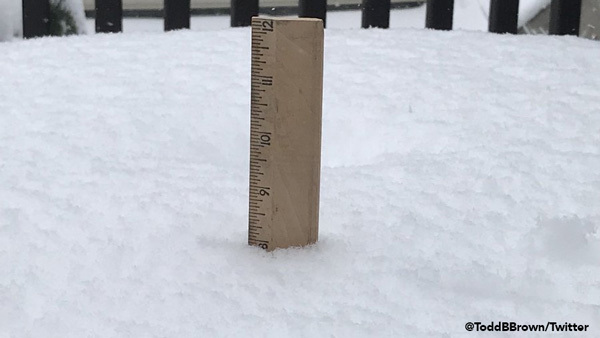 The final snow totals have come in for most of New Jersey, Philadelphia, and the Pa. suburbs. NJ residents deal with snow, hopes for spring weather. Trish Hartman reports during Action News at 11 p.m. on March 21, 2018. (Both Millville and Vineland never updated past 6:30pm Wednesday evening, so they probably picked up a little bit more than what is posted). Folks find ways to get around in snowy Chester County. John Rawlins reports during Action News at 4:30pm on March 21, 2018. Residents deal with city streets during the nor'easter. Christie Ileto reports during Action News at 11 p.m. on March 21, 2018.